A turn for the worse greets this issue of About Place Journal. Inequality is greater than any time since the age of robber barons and the today’s robber barons have bought power over the government, media and politics. Gains in civil and voting rights are overturned and specifically taken away. Woman’s rights are literally demonized and targeted for reversal as triumphs for value agendas. War clouds have begun to gather and storms approach with devastation to follow. Life on our planet is threatened by a commitment to intentionally blind profit driven consumption. November’s election guarantees that things will get worse before better. We believe that voices of the human spirit, such as presented here, can help to clarify the path and give energy to create another different progressive era. But why spirit? Spirit drives people in their quests large and small. Spirit pervades human activity. Spirit arises when individuals experience the separation of self and the larger existence. Spirit arises when individuals experience the connectedness of the self and the larger existence. For all this larger existence includes our world and society. For many, religion connects the self and what is beyond, for others it is sense of spirituality or transcendence not related to deity or traditional worship. For yet others nature provides the setting in which the individual is connected in an often mysterious way and still many participate in the creation of a better world with rejection of all but secular identification. In all of these spirit pervades. Spirit can be a force for worsening crises and conditions or it can be present and even essential in creating a sustainable and just world. Religion has been and still is a force for promoting violence, inequality, squandering the earth’s bounty with all the world’s major religions culpable. Religion has also been in the fore front of promoting peace, justice and the protection and sustaining of all creation. The same can be said of all beliefs and activities where spirit is found. These various places from which spirit speaks are not static or mutually exclusive. Voices of individuals or groups may speak from more than one of these places or from different places over time. Both religious and secular voices can speak in the same chorus to sustaining nature or creating a more just world. 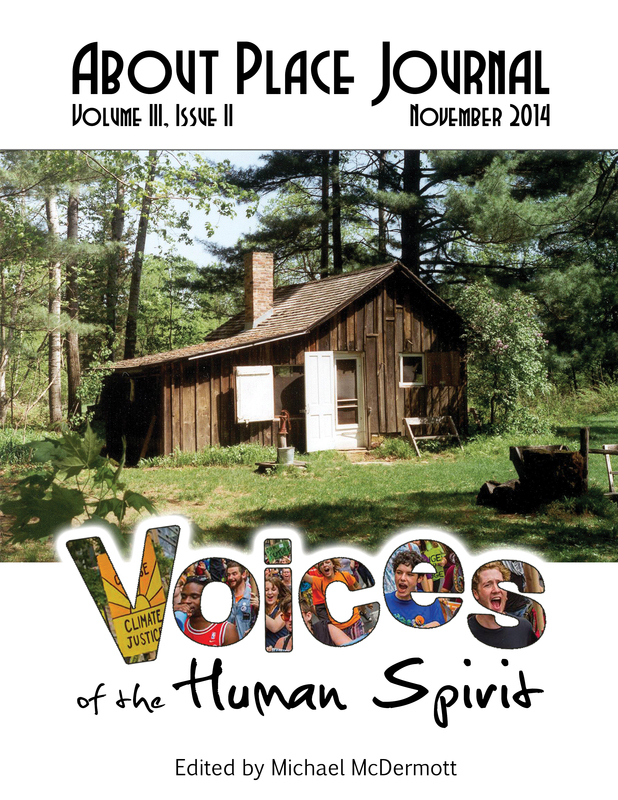 In this issue we present artistic voices of the human spirit ringing out for a sustainable and more just world. Our aim is to show the commonality and unity across the broad spectrum of beliefs and practices in addressing the path to this future. Too often the secularist looks down on the religious as ignorant and superstitious, more often some religious look at everything else an existential threat to their beliefs and way of life. These divisions can run deep even among those who stand for change and justice. These divisions stand blocking the way to progress. We aim to find what is common. ISSUE EDITOR: Michael McDermott, co-founder of the Black Earth Institute, is a semi-retired physician and a not retired social activist. He has lived at Brigit Rest in Black Earth, Wisconsin for 20 years. During this time he has worked to develop Brigit Rest into a retreat for artists and activists based on a reverence for the land and as a setting for Celtic influenced spirituality. With his late wife and BEI co-founder Patricia Monaghan Brigit Rest has a vineyard for wine grapes, a large organic garden and an orchard in addition to many trails and contemplative areas. They have provided Brigit Rest as home for the Black Earth Institute. Michael is the managing editor of About Place Journal, the literary journal of Black Earth Institute; co-edited with Patricia Monaghan the anthology, Brigit: Sun of Womanhood; and has published many articles on the clinical as well as the social aspects of asthma in our society. As he has watched the issues of About Place he has been struck by the varied expression of the sacred and the human spirit whether in writings about the natural world or in the movement of social activism. In this issue he seeks to have contributions that express this broad range voices bringing spirit to protecting and sustaining the earth and promoting social justice in all things. These voices range from the religious to the secular and are so needed in or times of climate change and injustice. ASSISTANT EDITOR: Teal Gardella lives and writes in Portland, Maine. She is a graduate of the Stonecoast M.F.A. program at the University of Southern Maine and is currently at work on a collection of short fiction. ASSISTANT EDITOR: Chris Wiewiora lived in Warsaw, Poland under the “Iron Curtain” where his parents served as Evangelical missionaries. His family moved to Orlando, Florida in 1996. He graduated with an Honors in the Major English BA from the University of Central Florida where he worked as an editor at the Florida Review. He now lives in Ames, Iowa where he managed Flyway: Journal of Writing and Environment as well as where he earned his Masters of Fine Arts in Creative Writing and Environment at Iowa State University. He serves on the editorial board of BULL: Men’s Fiction. His writing has been anthologized in Best Food Writing 2013 and published in Gastronomica, Redivider, Slice as well as on the Huffington Post, nerve, the Rumpus and many other magazines.